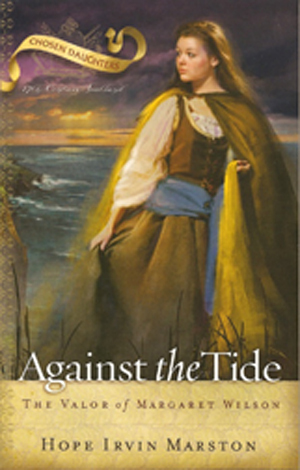 Against the Tide is a biography based on the life of a young martyr. Margaret, a young Covenanter, a stalwart for the faith, is eventually apprehended by the King’s forces. She refuses to recant and is executed by drowning while tied to a stake at low tide. The Chosen Daughters series highlights the lives of ordinary women who by God's grace accomplish extraordinary things. Against the Tide is a biography based on the life of a young martyr. Margaret, a young Covenanter, a stalwart for the faith, is eventually apprehended by the King’s forces. She refuses to recant and is executed by drowning while tied to a stake at low tide. The Chosen Daughters series highlights the lives of ordinary women who by God's grace accomplish extraordinary things. Grades 6-12. To read a sample chapter from Against the Tide, click here.